Perfect for when your little angel needs to be an angel; this child size angel costume is most popular for Biblical shows or Christmas pageants. It can even be worn for Halloween! 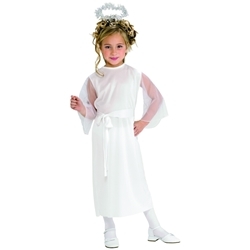 The kids angel costume includes a white gown, white belt waist sash, and silver tinsel halo headband. Costume is available in child size small, medium, or large. Costume is pictured on a girl but is unisex and can be worn by either boys or girls. Don't forget a pair of white wings to complete the look, we suggest either the white angel wings or the white feather wings.